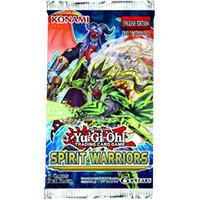 Spirit Warriors is a special booster set for the Yu-Gi-Oh! Trading Card Game consisting of 60 cards. It will be released on 16th of November 2017. Spirit Warriors will take full advantage of the latest updates to the Yu-Gi-Oh! Trading Card Game. On the one hand, that means more Link Monsters will be introduced to work with the newly built Extra Monster Zone. On the other hand, the set will introduce respectively deepen a new component of the game: the strategic placement of cards in certain zones and columns to use their effects. There are 9 cards per pack and 24 packs per box. This is a single booster pack.